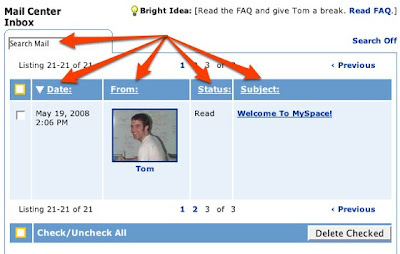 MySpace announced new functionality into their MySpace Message Center today at Google I/O. One feature that they were lacking was the ability for MySpace users to actually search their MySpace messages. To go through mail, users have to page through all of their messages until their find the right one. Not optimal to say the least! They could have tried to do search on the server side, but it can be a very expensive operation, and when you are at MySpace scale, you have to choose your battles. With server side search out, they looked at doing the work on the client. They ended up with a Gears powered solution that not only searches, but gives back results in real-time as you are typing it in. This means that you can stop typing earlier, as you find what you are looking for. The MySpace team has been a pleasure to work with, and were very fast to put the pieces together of an Full Text Search datastore, and the WorkerPool to offload the search without hanging the browser. As I type this Owyn Richen is going over the details of the implementation at his Google I/O session. We are excited to see them launch, and look forward to seeing what else they come up with!